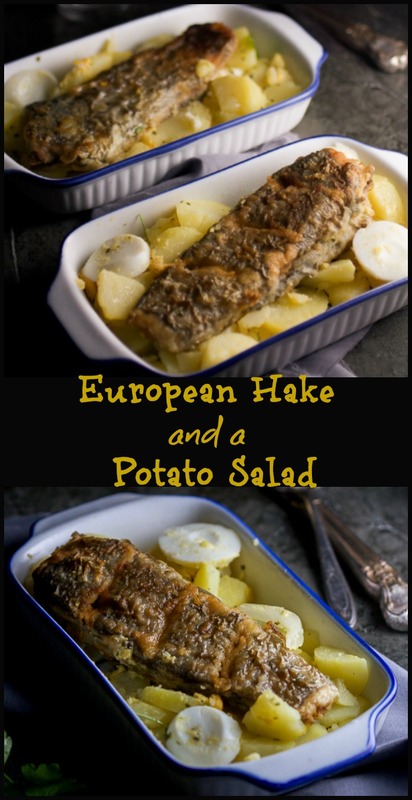 Learn to love fish: European hake (cod’s cousin) with a Balkan potato salad typically served with seafood. I ate a good amount of seafood when I was a child, but these days I have to remind myself to put fish on my shopping list. It could be because salmon seems to be the fish choice of the day and, I admit, I never learned to make it well. I like eating salmon, I do. But frying or baking – regardless of the recipe – my salmon does not come out juicy and soft as it’s supposed to. As the summer – although moody and uncertain – is arriving, it inspired me to look through the treasure chest that is seafood for a flavorful fish recipe to share with you. And thus the hake, cod’s European cousin. 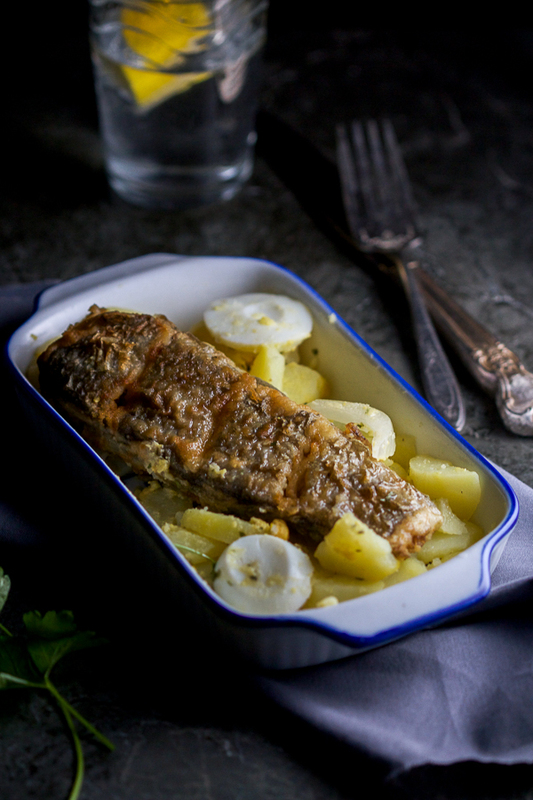 Hake is a sea fish, light on the stomach, but meaty so you feel as if you’ve actually eaten a hearty meal. It’s sold frozen and fresh. I’ve used the frozen one for today, and I was skeptical about the process. 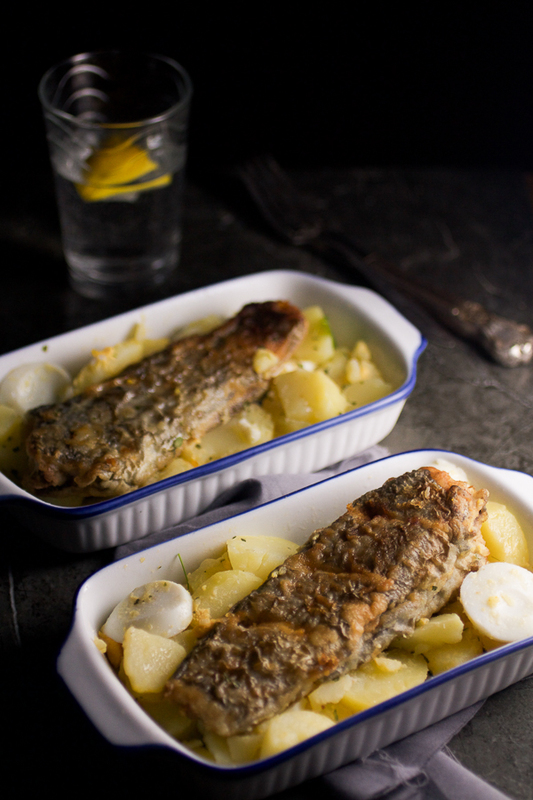 However – maybe you can gleam from the photos – these hakes turned out to be some of the best fish I’ve ever had. No longer will salmon terrorize me by coming out dry and choppy. 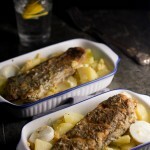 And if salmon is your favorite, I urge you to experiment a little bit with hake (or cod if you can’t find hake). You may find your new favorite fish. 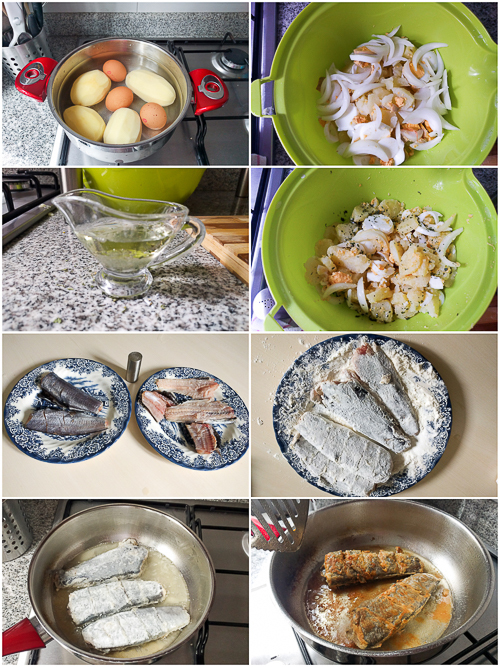 Hake (European cod) recipe and the story below were authored by Samir Hajdarević. Hake fried in oil, coated with just the flour, is one of my favorite fish dishes. Made simply like this it’s still quite flavorful, and I am a big fan of meals that don’t require too much effort. I’ve loved fish for as long as I can remember. It’s not surprising as my mother is from Dalmatia, and even though I was born in Sarajevo, I’ve spent a large part of my life near the sea. It was mom’s uncle who inspired my love for anything that has to do with the sea (including cooking). I remember him in his later years. As an older man possessing an exquisitely tall and lank figure. Although he was up in the years, he always stood tall and he exuded dignity. He was not a man of many words. More of a quiet, introspective type. It was exactly that quietness, combined with his sharp and strong gaze, that made one feel he was stern. In reality he was a good and warm person, but as a boy I experienced him as an authority. Now when I think of him, he reminds me of film heroes played by Clint Eastwood. Strong, disciplined types that aren’t sure what to do with emotions. As I did not know my grandfather on mom’s side, and mom’s uncle never got married, the role of a grandfather, somehow naturally fell onto him. And I called him, as it’s a customary in that part of Dalmatia (Dubrovnik, Pelješac, Korčula), dundo. Like many men in Dalmatia, he also spent time fishing. Usually once a week. He’d get up at early dawn. He’d sit at his place at the table, and drink a glass of bevanda (wine and water beverage, usually a 50-50 mix), and then he’d walk to the waterfront where a wooden boat called barka was tied. He’d stay out all day. He’d return late, just before dinnertime, when the sun set far away to the West. When he determined I was old and strong enough, he started to take me with him. We’d usually fish with nets, a little bit less often with longlines, or we’d throw in the fish cage. Dundo knew the sea almost perfectly, he knew the best places to fish, those rich with sea life. Nets, stretched out, in most cases brought in a heavy catch, although there were days when we pulled them out and they were practically empty. Dundo never got excited either way about the day’s catch. If it was bad, he never showed disappointment, and when it was good he never showed satisfaction as not to test fate. We usually fried the fish on a grill, coated only with local olive oil made from our trees. Fried fish, caught that day, with homemade wine and a group of close friends with whom we’d talk about anything and everything. That was the ideal epilogue to a day such as one of those. At some point in the night, dundo would separate and come back near the house, where he’d stand and drink his bevanda looking at the sea. Looking at him like that, I always had a feeling he had the ability to talk with it. Peel the potatoes and place in a large pot filled with water. Add eggs and bring to a boil. Eggs will take about 15 minutes after the boiling point to be very hard, so you can take them out at that time and place in a bowl with cool water. Time varies for the potatoes, so check them with a fork every few minutes. When they’re soft, but not overly soft, they’re ready to be taken out. Place in a bowl with eggs to cool. Peel the eggs and cut into thin rounds the thickness of three pennies. Cut the potatoes up the same way. Chop up the onion. Combine all three, add spices, and let it rest for a minute. Prepare the vinaigrette by combining all ingredients and stirring. Pour over eggs, potatoes and onion and mix well. Place the salad in the fridge. Heat oil on high in a deep skillet until it’s really hot. Pour flour on a plate evenly. Dip each fillet in the flour and place in the skillet. Lower temperature just a little bit. Fry the first side for about 4-5 minutes. Flip and fry another 3-4 minutes. Place on a paper towel to soak up the extra oil. Serve with potato salad. For best taste, squeeze more lemon juice over the fish.